Senior reporter for The Canberra Times. ACT government schools are slowly but surely clawing back a proportion of students from non-government schools in the primary and high school years but independent schools this year have taken a dramatic share of government college, and Catholic systemic school year 11 and 12 students. Government colleges lost 62 students and Catholic systemic schools lost 70 year 11 and 12 students, according to the latest census of enrolments. Independent schools, meanwhile, picked up 131 new year 11 and 12 students. A breakdown of the enrolment statistics show the growth was mainly at three boys' schools - Marist College, which gained 38 students, Canberra Grammar, which gained 35 students, and St Edmund's, which gained 29 students. The normally popular government college system had not had a drop in enrolments for five years. The count of all ACT students from primary school through to college, taken on February 20, shows government schools have registered overall enrolment growth for the fifth year running and this year have enrolled a slightly larger percentage of students than non-government schools. The ACT has the highest percentage of non-government school students in the nation - at 40.6 per cent compared with 34.9 per cent nationally. In the high school years, the majority of ACT students attend private schools. The 2013 census found there were 68,825 students enrolled at all ACT schools - an increase of 1289, or 1.9 per cent, on last year. Public schools accounted for 59.4 per cent of enrolments - 40,879 students - an increase of 805 students, or 2 per cent growth on last year. Non-government schools accounted for 27,946 enrolments, an increase of 484 students or 1.8 per cent growth. For government school principals such as Sue Harding, who runs Mount Rogers Primary School in Belconnen, it means something of a juggling act to accommodate 70 new students , or a 19 per cent increase on last year's 362 student body. The school has put on two new classes and is refurbishing a wing to provide extra space. ''These are fabulous problems to have,'' Ms Harding said. She attributed the school's popularity to a quality program in the early years and a thriving pre-school and playgroup community which had strong links to the primary school. ''I think families know we put a lot of effort into nurturing the very young ones and that there will be strong family links and support for them when they come into kindy and right through to the older years,'' she said. Across the ACT, public primary school enrolments grew by 714, or 3 per cent, while public high school enrolments grew by 140, or 1.5 per cent and college enrolments decreased by 62, or 1 per cent. In the private sector, primary enrolments grew by 356, or 2.6 per cent, while high school enrolments grew by 67, or 0.7 per cent and college enrolments grew by 61 or 1.6 per cent. Total high school enrolments in government schools grew by 140 to reach 9754 while total non-government high school enrolments grew by 67 to 9794. 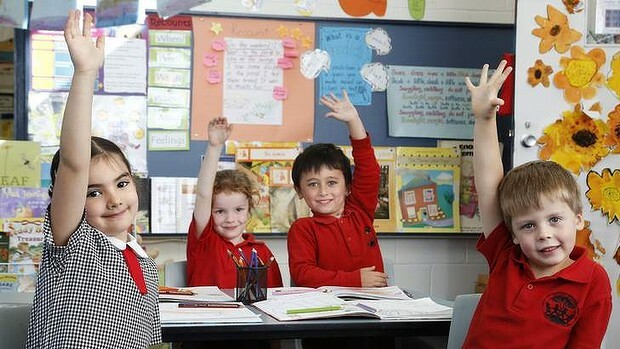 Non-government schools hold a 50.1 per cent share of high school enrolments, down from 50.3 last year and 50.4 in 2011. The total number of Aboriginal and Torres Strait Islander students in all schools increased by 100 this year, or 6.1 per cent, and the majority of these new enrolments went to the private sector. The number of students with special education needs increased by 241 students, or 9.8 per cent. Of these 145 went to government schools and 96 went to private schools. The government sector holds nearly 76 per cent of all students with special education needs. Oscar nominations (or not), weekend dates with his wife in a hotel and working with great Australian actresses. PS catches up with Baz Luhrmann. Now is the time to organise your 2014 care! Switch to UBank and receive $2014! Conditions apply. Get 0% p.a. for 15 months on balance transfers. When does daylight saving time end in Canberra in 2014? Victim robbed of $14k in jewellery after being labelled "so bling"